The editor of a monthly crime and detective magazine assigns to two of his staff writers, Sladen and Low, the investigation of the strange disappearance of an unknown showgirl. The disappearance was reported fourteen months earlier, but the trail is cold. The police, with nothing to work on, have lost interest. The assignment doesn’t look hopeful. However, the investigators start asking questions and almost immediately things begin to happen. Witnesses are murdered, an attempt is made to do away with the investigators. The police once more open the case. The disappearance of the showgirl is found to be only a minor part of a ruthless plot. Safer Dead has the authentic James Hadley Chase touch, which has deservedly earned him the title ‘Master of the Art of Deception’. It moves with the pace and power of forked lightening. Robert Hale Ltd. Made and printed in Great Britain by John Gardner (Printers) Ltd. First published 1954. This edition reprinted December 1956. Another gorgeous James Hadley Chase paperback to compliment I’ll Bury My Dead, included in an earlier post. This cover is illustrated by James Pollack who did the cover on Harley Street Hypnotist, below. Posted in books, books and more books and tagged harley street hypnotist, i'll bury my dead james hadley chase, james hadley chase, james pollack cover art, pulp fiction, safer dead, vintage books, vintage crime, vintage paperbacks. Bookmark the permalink. Harlequin have a series of composition books, featuring the coverart of six vintage titles, and they look stunning. One of the books is I’ll bury my dead by James Hadley Chase. The Harlequin reprint can be seen HERE. Below is the original cover art on one of my Pocket Editions. I’LL BURY MY DEAD by James Hadley Chase. A Robert Hale Pocket Book, this edition 1955. The action in Mr Chase’s new, sophisticated thriller is crammed into the space of six hair-raising, breathless days and nights. It is the story of organised blackmail, punctured by sudden and gruesome murder, peopled by ruthless killers, shady cops and Mr. Chase’s own particular brand of young ladies. Written with the punch and speed of a rivet gun, and with an economy of words that will hold the reader’s attention from the first to the last page, I’ll Bury My Dead again confirms the reputation won by James Hadley Chase as the leading writer of all-action, thrill-a-minute, toughness-plus-one thrillers that demand to be read at a sitting. 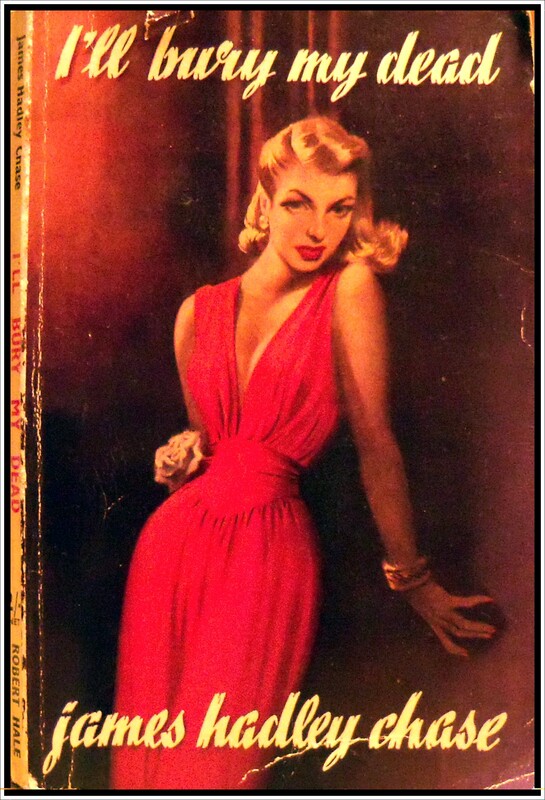 I’ve not read any of Hadley Chase’s novels, so I can’t comment on his own ‘particular brand of young ladies’ but, if the cover is anything to go by, they look like a force to be reckoned with! Posted in books and more books, Uncategorized and tagged books, Cover art, crime, i'll bury my dead james hadley chase, james hadley chase, murder, pulp paperbacks brighton, vintage paperback, vintage pulp. Bookmark the permalink.